TVSquad reported on this about a month ago and I meant to blog about it then, but I didn’t. 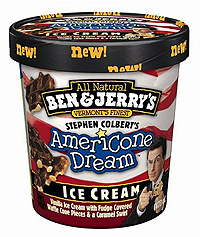 Now it seems the deal is sealed and it shouldn’t be long before Stephen Colbert’s Americone Dream hits the shelves. Here’s a handy little google map from the nofactzone, to help you find which retailer near is carrying the flavor of America’s Favorite Pundit.